von Hippel-Lindau syndrome. Transaxial nonenhanced and contrast-enhanced CT scans through the cerebellum in a 34-year-old patient with a family history of VHL. 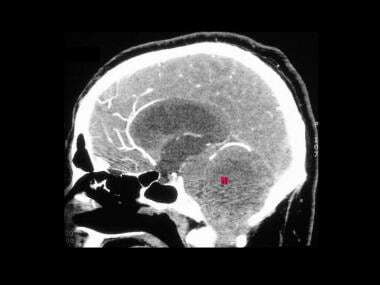 Scans show a midline cerebellar cystic lesion with an enhancing nodule (arrow) due to cerebellar hemangioblastoma. von Hippel-Lindau syndrome. T1-weighted transaxial gadolinium-enhanced MRIs of the same patient as in the previous image show a well-defined hypervascular enhancing mass. von Hippel-Lindau syndrome. 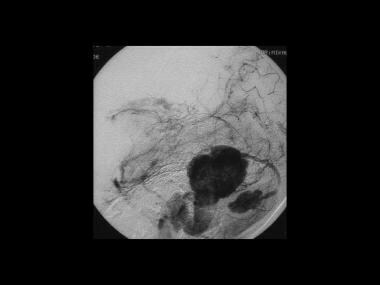 Coronal vertebral angiogram of the same patient as in the previous 2 images shows a hypervascular intramural nodule that demonstrates a prolonged and intense enhancement with a surrounding avascular area, which represents the cyst surrounding the mural nodule. Note the stretching around the cyst. von Hippel-Lindau syndrome. Sagittal vertebral angiogram of the same patient as in the previous 3 images shows a hypervascular intramural nodule (open arrow) that demonstrates a prolonged and intense enhancement with a surrounding avascular area, representing the cyst surrounding the mural nodule (solid arrows). Note the stretching of vessels around the cyst. 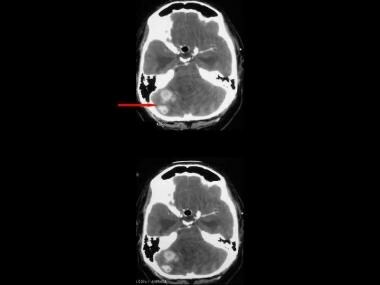 The final diagnosis was a cerebellar hemangioblastoma associated with von Hippel-Lindau syndrome (same patient as in Images 1-3). Symptoms often begin in the second to third decades of life. Patients may present with ocular signs and/or symptoms due to retinal hemorrhage, retinal detachment, glaucoma, or uveitis. Funduscopic examination may reveal tortuous aneurysms of the retinal vessels, exudates on the fundus, and subretinal yellowish spots. Patients may present with neurologic symptoms such as headaches, ataxia, and blindness. The exact neurologic deficit depends on the site of the primary lesion. The limitation of various techniques depends on the size of the tumor and on problems with atypia. CT is an excellent modality for detecting tumors anywhere in the body, but it has the disadvantage of ionizing radiation, which may become problematic in screening asymptomatic patients and at-risk relatives. von Hippel-Lindau syndrome. A 16-year-old female adolescent with a family history of von Hippel-Lindau syndrome presented with generalized bone pain, weight loss, and hypertension. This skull radiograph was part of the skeletal survey. 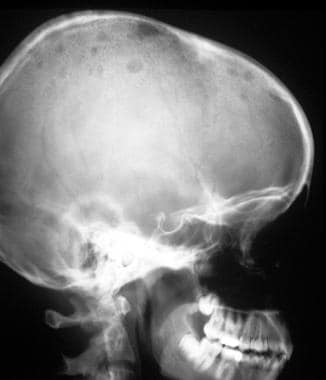 The lateral skull radiograph demonstrates well-defined lytic lesions throughout the calvarium. Confidence in the diagnosis of VHL with plain radiographs is low. Hemangiomas of the bone must be differentiated from osteoblastic metastases, lesions due to Paget disease, lymphoma, and monostotic fibrous dysplasia. Hemangioblastomas usually do not become calcified, and this is a finding that helps in differentiating these lesions from cystic astrocytomas (which are calcified in 25% of patients). 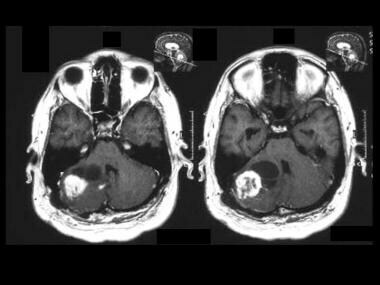 Typical pilocytic cystic astrocytomas also occur in patients much younger than most patients with hemangioblastomas. Choroidal capillary hemangiomas are aggressive lesions that are histologically similar to cerebellar hemangioblastomas. Approximately 25-30% of these lesions occur in patients with VHL. CT scans demonstrate enhancing lesions. Retinal hemangiomas are too small to be depicted on CT scans, and the diagnosis chiefly depends on the results of an ophthalmoscopic examination. 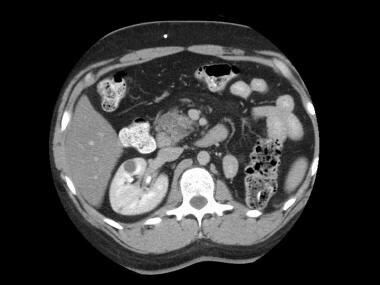 CT has a low sensitivity in the detection of renal cell carcinoma associated with von Hippel-Lindau syndrome because of its inability to reliably differentiate cystic renal cell carcinomas, cancers within a cyst, and atypical cysts. Therefore, a multimodality approach is more appropriate. Renal adenomas are potentially premalignant. These adenomas are usually smaller than 3 cm, are subcapsular cortical, and are impossible to differentiate from renal cell carcinomas. They are multiple in 25% of patients. Endolymphatic sac tumors are destructive and contain calcification centered on the retrolabyrinthine region. All papillary endolymphatic sac tumors have a thin peripheral rim of calcification, representing the expanded cortex of petrous bone. Endolymphatic sac tumors are slow growing and spread in 2 directions (ie, laterally toward the external ear, in the direction of the jugular foramen, and medially into the cerebellopontine angle). On CT scans, the margins of these tumors are geographic or moth-eaten in appearance, and the intratumoral bone appears reticular or spiculated. After the intravenous administration of contrast material, areas of patchy enhancement are interspersed with cystic areas. Although the lesion is a benign lesion, it typically has elevated tumor blood volume on perfusion CT, which is more typical for malignant lesions. See the following computed tomography scans depicting von Hippel-Lindau syndrome. von Hippel-Lindau syndrome. 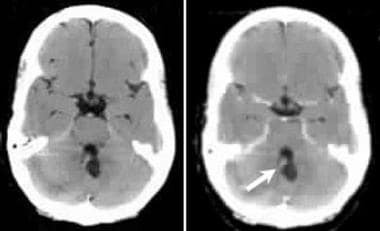 Axial nonenhanced CT scan of the head in a patient with known von Hippel-Lindau syndrome and an acute neurologic presentation shows hyperattenuating areas within a right cerebellar tumor suggestive of hemorrhage. Note that the tumor is causing moderate hydrocephalus. von Hippel-Lindau syndrome. Transaxial bone-window CT scan through the head shows destructive lesions throughout the calvarium. Some lesions cross the entire thickness of the skull. von Hippel-Lindau syndrome. 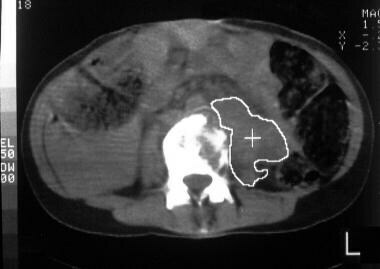 Axial CT scan through the abdomen shows soft-tissue retroperitoneal masses. von Hippel-Lindau syndrome. Axial CT scan through the abdomen shows bone destruction. The histologic diagnosis was von Hippel-Lindau–associated malignant pheochromocytoma with extensive metastases (same patient as in the previous image). von Hippel-Lindau syndrome. This 46-year-old man with known von Hippel-Lindau syndrome presented with gross hematuria. 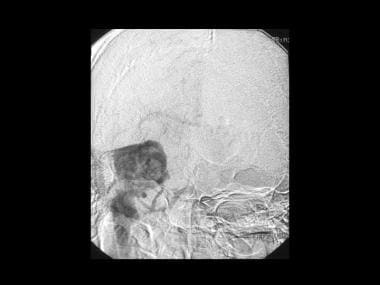 Intravenous urogram and sonogram showed a mass lesion within the midpoles/upper pole of the right kidney. CT was performed for further staging. Contrast-enhanced axial CT scan through the kidneys shows a hypoattenuating mass in the right kidney extending into the renal pelvis. von Hippel-Lindau syndrome. Transaxial contrast-enhanced CT scans through the cerebellum in the same patient as in the previous image (lower sections). Scans show multiple right cerebellar enhancing partially cystic lesion due to cerebellar hemangioblastoma. von Hippel-Lindau syndrome. Sagittal reconstruction of contrast-enhanced CT scans (same patient as in the previous 2 images). 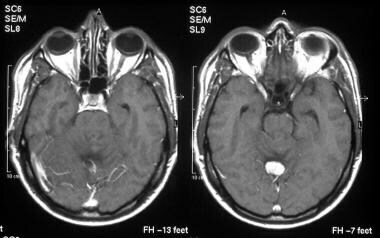 Scans show a posterior fossa mass a due to cerebellar hemangioblastoma. von Hippel-Lindau syndrome. Sagittal volume rendering of contrast enhanced CT scan of the same patient as in the previous 3 images shows 2 intensely enhancing lesions in the posterior fossa with arterial supply derived from the posterior fossa circulation. von Hippel-Lindau syndrome. Axial volume rendering of contrast enhanced CT scan (same patient in Images 18-40) shows 2 intensely enhancing lesions in the posterior fossa with arterial supply derived from the posterior fossa circulation. von Hippel-Lindau syndrome. Axial contrast enhanced axial CT in the portal venous phase at the renal level. 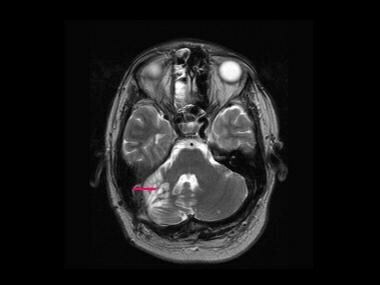 The scan was performed as a part of surveillance 12 months following surgery for cerebellar hemangioblastoma. The scan shows multiple pancreatic cysts, a small right renal cyst, and a solid 4.5 cm mass, mid pole left kidney, encroaching on the renal pelvis. A left nephrectomy was performed. Pathological diagnosis was that of a renal cell carcinoma. von Hippel-Lindau syndrome. Axial contrast enhanced upper abdominal CT scans (same patient as in the previous image) in the portal venous phase. These scans were performed 6 months following left nephrectomy. Note cysts within the pancreas and the right kidney. Note also a solid 3 cm lesion (mid pole, right kidney, posterior renal cortex). A further smaller lesion is seen in the renal cortex more anteriorly, which is too small to characterize. The patient is awaiting a partial nephrectomy. von Hippel-Lindau syndrome. Axial contrast enhanced upper abdominal CT scans (same patient as in the previous 2 images) in the portal venous phase. These scans were performed 6 months following left nephrectomy. Note cysts within the pancreas and the right kidney. Note also a solid 3 cm lesion (mid pole, right kidney, posterior renal cortex). A further smaller lesion is seen in the renal cortex more anteriorly, which is too small to characterize. The patient is awaiting a partial nephrectomy. von Hippel-Lindau syndrome. Axial contrast enhanced upper abdominal CT scans (same patient in the previous 3 images) in the portal venous phase. These scans were performed 6 months following left nephrectomy. Note cysts within the pancreas and the right kidney. Note also a solid 3 cm lesion (mid pole, right kidney, posterior renal cortex). A further smaller lesion is seen in the renal cortex more anteriorly, which is too small to characterize. The patient is awaiting a partial nephrectomy. von Hippel-Lindau syndrome. Axial contrast enhanced upper abdominal CT scans (same patient as in the previous 4 images) in the portal venous phase. These scans were performed 6 months following left nephrectomy. Note cysts within the pancreas and the right kidney. Note also a solid 3 cm lesion (mid pole, right kidney, posterior renal cortex [red arrow]). A further smaller lesion is seen in the renal cortex more anteriorly, which is too small to characterize (blue area). The patient is awaiting a partial nephrectomy. von Hippel-Lindau syndrome. Axial contrast enhanced upper abdominal CT scans (same patient as in the previous 5 images) in the portal venous phase. These scans were performed 6 months following left nephrectomy. Note cysts within the pancreas and the right kidney. Note also a solid 3 cm lesion (mid pole right kidney posterior renal cortex). A smaller lesion is seen in the renal cortex more anteriorly, which is too small to characterize. The patient is awaiting a partial nephrectomy. 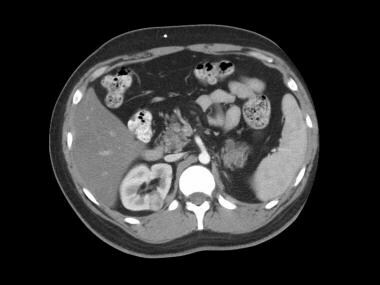 Axial upper abdominal CT scans unenhanced and enhanced show multiple small cysts within the pancreas and larger renal cysts. There are 2 enhancing lesions suggestive of microcystic adenomas. CT findings are not reliable in differentiating cystic renal cell carcinomas, cancers within a cyst, and atypical cysts. Differentiating a renal cell adenoma from a renal cell carcinoma is impossible. The differential diagnosis of VHL should include sporadic hemangioblastoma, cystic astrocytoma, arachnoid cyst, cystic metastases, renal adenoma, renal cell carcinoma, renal cysts, pancreatic islet cell tumors,  and MEN 2. Tumors of the endolymphatic sac may mimic other cerebellopontine tumors. MRI appearances of a hemangioblastoma are those of a well-demarcated cystic lesion with a highly vascular mural nodule that abuts on the pia mater. Appearances of the cystic component vary depending on the protein concentration and/or presence of hemorrhage within the cyst. The cystic component may be isointense relative to cerebrospinal fluid (CSF) on images obtained with all pulse sequences, but more often, it is slightly hyperintense relative to CSF on T1- and T2-weighted images. Mural nodules are slightly hypointense on T1-weighted images and hyperintense on T2-weighted images, and they are avidly enhancing after the administration of contrast material. Large feeding or draining vessels are often present at the periphery and within the solid component, and they may show tubular areas of flow void on spin-echo images. 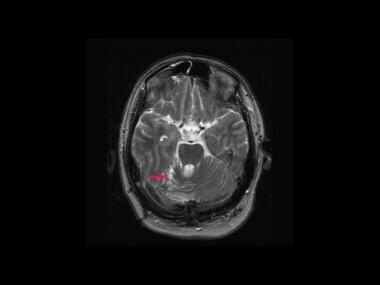 Although the lesion is benign, it may resemble malignant lesions on advanced MR images. 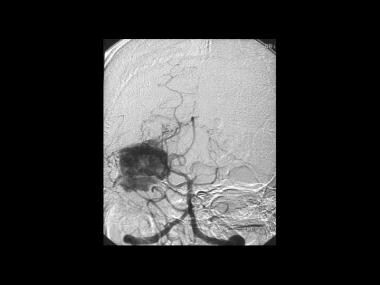 It may have elevated relative tumor blood volume on perfusion MR. Similarly, it may show elevated choline on MR spectroscopy. Endolymphatic sac tumors are heterogeneous on both T1- and T2-weighted images. They are associated with focal high signal intensity on T1-weighted images due to subacute hemorrhage and with areas of low signal intensity due to calcification or hemosiderin. Blood and protein-filled cysts have high signal intensity on both T1-weighted and T2-weighted images; a finding of these cysts may suggest the diagnosis. Tumors larger than 2 cm may have flow voids. After the administration of contrast material, the tumor enhances heterogeneously. On MRIs, choroidal capillary hemangiomas associated with VHL are minimally hyperintense on T1-weighted images. They may mimic ocular melanoma, but unlike pigmented melanoma, they are usually hyperintense on T2-weighted images. As a result of the small size of retinal hemangiomas (1.5-2.0 mm), they are usually not identified on MRIs. Spinal hemangioblastomas are intramedullary tumors in most patients (75%), but they may be radicular (20%) or intradural extramedullary (5%). Most of these tumors are located in the cervicothoracic spine. They usually expand the cord and have an intratumoral cystic component. On MRIs, they appear as a well-demarcated gadolinium-enhancing mass. Spinal hemangioblastomas are an unusual cause of cryptic subarachnoid hemorrhage. Patients with subarachnoid hemorrhage with negative cerebral angiography may benefit from contrast-enhanced spinal MRI to rule out an occult spinal hemangioblastoma. An intramural nodule that enhances intensely may be visible. Large dorsally placed draining veins may appear as curvilinear areas of signal void. A syrinx is a frequently associated finding. 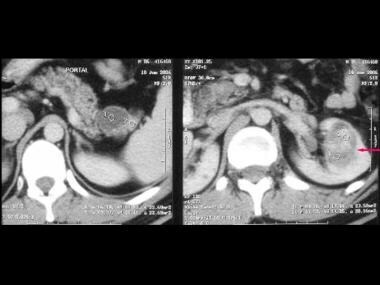 A pheochromocytoma associated with VHL has MRI appearances no different from those of the sporadic form. The tumor appears isointense or slightly hypointense relative to the liver on T1-weighted images, and it is extremely hyperintense on T2-weighted images. Magnetic resonance images of von Hippel-Lindau syndrome are depicted below. von Hippel-Lindau syndrome. 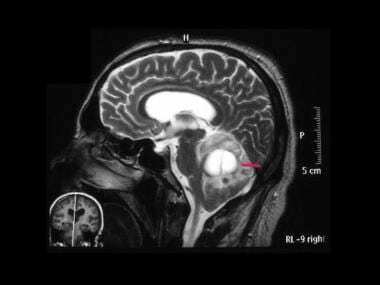 Coronal T1-weighted MRI shows an enhancing lesion in the right cerebellar hemisphere compressing and displacing the aqueduct and fourth ventricle to the left. Note the tubular areas of flow void resulting from large blood vessels and the cystic tumor component. von Hippel-Lindau syndrome. Coronal T1-weighted MRI (same patient as in the previous image) shows an enhancing lesion in the right cerebral hemisphere that compresses and displaces the aqueduct and fourth ventricle to the left. 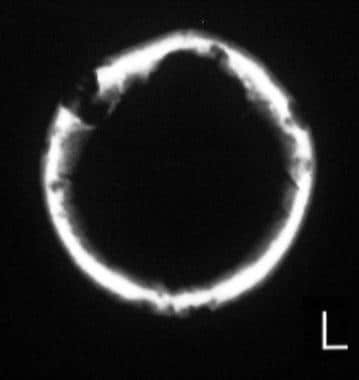 Note the tubular areas of flow void resulting from large blood vessels. von Hippel-Lindau syndrome. Oblique coronal T1-weighted gadolinium-enhanced MRI through the right kidney shows a hypointense linear mass extending from the renal capsule to the renal pelvis. At surgery, a renal cell carcinoma was confirmed. von Hippel-Lindau syndrome. 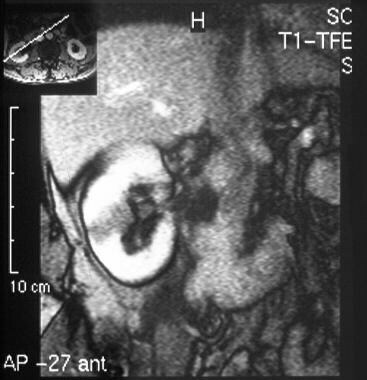 Coronal T1-weighted contrast enhanced MRI shows an intensely enhancing cerebellar lesion (red arrow) with a large cystic tumor component (white arrow). von Hippel-Lindau syndrome. Coronal T1-weighted contrast enhanced MRI (same patient as in the previous image) shows, at lower sections, an intensely enhancing cerebellar lesion with a large cystic tumor component. Note also the enhancing mural nodules and intratumoral flow void due to large pathological vessels. von Hippel-Lindau syndrome. Sagittal T2-weighted MRI (same patient as in the previous 2 images) shows a cerebellar lesion with a large septate cystic component (arrow). Note the hydrocephalus. von Hippel-Lindau syndrome. Sagittal T2-weighted MRI (same patient as in the previous 3 images) shows a cerebellar lesion with a central low signal component related to intratumoral hemorrhage. von Hippel-Lindau syndrome. Axial T2-weighted MRI shows high signal nodules in the region of previous surgical resection of hemangioblastoma in an 18-month surveillance scan. An earlier scan showed no nodular lesions in this region. The appearance suggests a recurrence of hemangioma. von Hippel-Lindau syndrome. 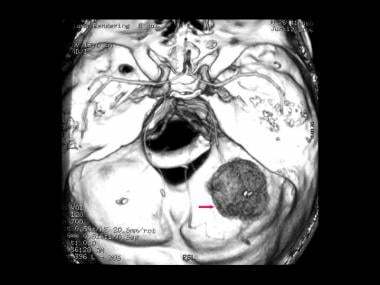 Axial T2-weighted MRI (same patient as in the previous image) shows high signal nodules in the region of previous surgical resection of hemangioblastoma in an 18-month surveillance scan. An earlier scan showed no nodular lesions in this region. The appearance suggests a recurrence of hemangioma. Characteristics of NSF/NFD include red or dark patches on the skin; burning, itching, swelling, hardening, and tightening of the skin; yellow spots on the whites of the eyes; joint stiffness with trouble moving or straightening the arms, hands, legs, or feet; pain deep in the hip bones or ribs; and muscle weakness. MRI is the modality of choice for imaging the central nervous system in patients in whom hemangioblastoma is suggested and for screening asymptomatic patients with VHL and their relatives at risk for VHL. 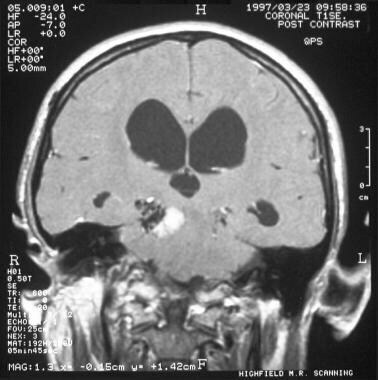 False-positive diagnoses may occur with cystic astrocytomas, which are usually smaller than 5 cm in diameter; these may be calcified, and they usually have thicker walls. Cystic metastases occasionally resemble a hemangioblastoma superficially. Spinal hemangioblastomas must be differentiated from intramedullary hemorrhage. 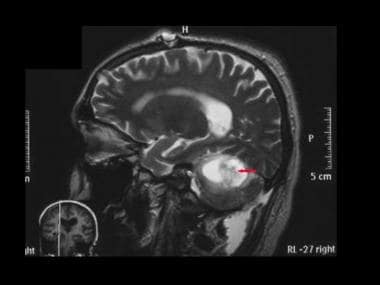 Endolymphatic sac tumors may mimic other cerebellopontine tumors. Nonfunctioning adrenal adenomas, adrenocortical adenomas, and adrenal cysts must be differentiated from pheochromocytomas associated with VHL. Ultrasonography is an excellent modality for screening the abdomen in patients with known VHL or their at-risk relatives. It has a high sensitivity in depicting cystic intra-abdominal masses and in characterizing the contents of cysts. Differentiating a renal cell adenoma from a renal cell carcinoma may not be possible. Similarly, difficulties may be encountered in differentiating a complex benign cyst from cystic malignant transformation. Much of the present value of nuclear medicine is in positron emission tomography (PET). PET with fluorodeoxyglucose (FDG) provides an indication of metabolic activity of CNS tumors; this finding is well correlated with the tumor growth rate in most tumors. However, this correlation may not be applicable to some tumors such as pilocytic astrocytomas and hemangioblastomas, which are histologically benign but may resemble high-grade lesions on FDG-PET. FDG-PET scans are unaffected by postoperative reactions or steroids, and they can provide information about residual tumor or tumor recurrence. 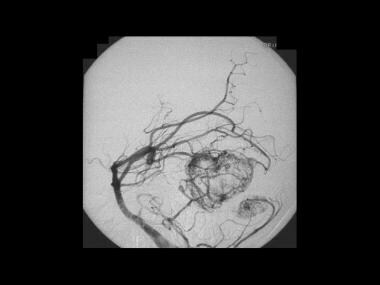 Many centers prefer to use perfusion MR/CT instead of PET for essentially the same purpose. Radionuclides can also be used (1) to detect bone metastases resulting from primary malignant bone lesions due to malignancies associated with VHL and (2) to assess renal function prior to resection of renal tumors. Iodine-131 metaiodobenzylguanidine (131 I MIBG) is a useful scanning agent in the detection of pheochromocytoma. 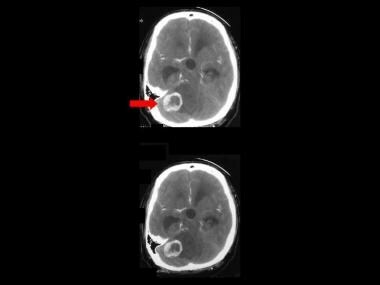 This technique is particularly useful when clear clinical and laboratory evidence of tumor exists but when CT scans and MRIs demonstrate no abnormality. Iodine-131 MIBG can be used for whole-body scintigraphy in which functioning metastasis from a malignant pheochromocytoma may also be detected; this approach may provide the future therapeutic options (eg,131 I MIBG methods to treat metastases). Scintigraphic images of VHL are shown below. von Hippel-Lindau syndrome. 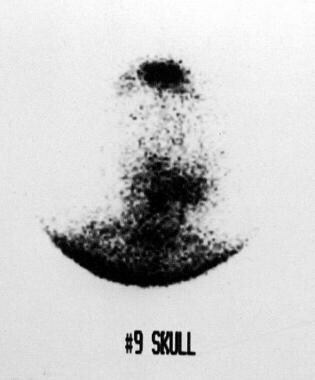 Scintigraphic image of the skull after iodine-131 metaiodobenzylguanidine administration shows multiple foci of isotope uptake. von Hippel-Lindau syndrome. 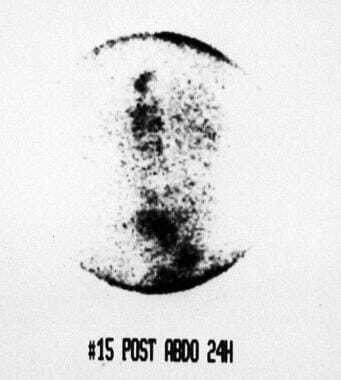 Scintigraphic image of the retroperitoneum (same patient as in the previous image) after iodine-131 metaiodobenzylguanidine administration shows multiple foci of isotope uptake. Iodine-131 MIBG uptake has a sensitivity of 80-90% and a specificity of 98% in the detection of pheochromocytoma. Uptake may occur in medullary carcinoma of the thyroid, carcinoid tumors, neuroblastoma, and paragangliomas. von Hippel-Lindau syndrome. Sagittal vertebral angiogram shows a hypervascular lesion with intense and prolonged enhancement with an avascular cystic component. Note the large draining vein. von Hippel-Lindau syndrome. Sagittal vertebral angiogram (same patient as in the previous image) shows a hypervascular lesion with intense and prolonged enhancement with an avascular cystic component. Note the large draining vein. von Hippel-Lindau syndrome. Sagittal vertebral angiogram (same patient as in the previous 2 images) shows a hypervascular lesion with intense and prolonged enhancement with an avascular cystic component. Note the large draining vein. von Hippel-Lindau syndrome. 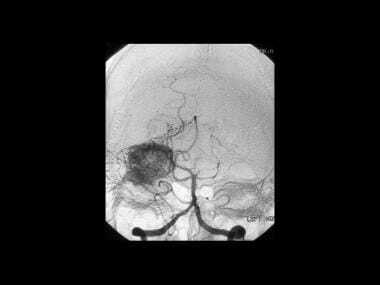 Sagittal vertebral angiogram (same patient as in the previous 3 images) shows a hypervascular lesion with intense and prolonged enhancement with an avascular cystic component. Note the large draining vein. von Hippel-Lindau syndrome. Sagittal vertebral angiogram (same patient as in the previous 4 images) shows a hypervascular lesion with intense and prolonged enhancement with an avascular cystic component. Note the large draining vein. von Hippel-Lindau syndrome. Sagittal vertebral angiogram (same patient as in the previous 5 images) shows a hypervascular lesion with intense and prolonged enhancement with an avascular cystic component. Note the large draining vein. 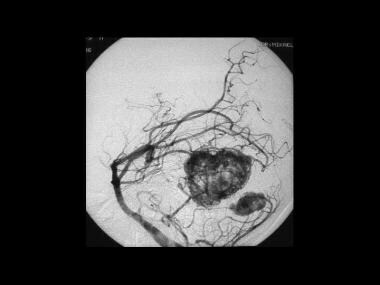 Angiographic appearances are nonspecific and can occur with other vascular tumors. 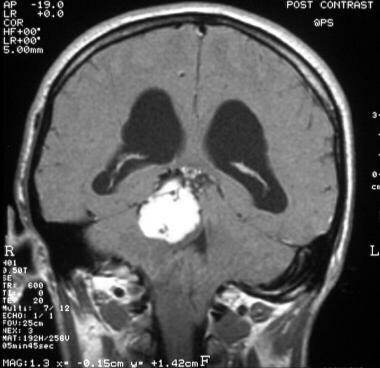 Cystic meningioma and a meningeal hemangiopericytoma may resemble a hemangioblastoma superficially, but confusion is unlikely when the clinical presentation and the other imaging findings are considered. Bell D, Gidley P, Levine N, Fuller GN. Endolymphatic sac tumor (aggressive papillary tumor of middle ear and temporal bone): sine qua non radiology-pathology and the University of Texas MD Anderson Cancer Center experience. Ann Diagn Pathol. 2011 Apr. 15(2):117-23. [Medline]. Tamura K, Nishimori I, Ito T, Yamasaki I, Igarashi H, Shuin T. Diagnosis and management of pancreatic neuroendocrine tumor in von Hippel-Lindau disease. World J Gastroenterol. 2010 Sep 28. 16(36):4515-8. [Medline]. [Full Text]. Davenport MS, Caoili EM, Cohan RH, Hoff CN, Ellis JH. Pancreatic manifestations of von Hippel-Lindau disease-effect of imaging on clinical management. J Comput Assist Tomogr. 2010 Jul. 34(4):517-22. [Medline]. Bonneville F, Sarrazin JL, Marsot-Dupuch K, et al. Unusual lesions of the cerebellopontine angle: a segmental approach. Radiographics. 2001 Mar-Apr. 21(2):419-38. [Medline]. Maher ER, Bentley E, Payne SJ, et al. Presymptomatic diagnosis of von Hippel-Lindau disease with flanking DNA markers. J Med Genet. 1992 Dec. 29(12):902-5. [Medline]. Maher ER, Yates JR, Harries R, et al. Clinical features and natural history of von Hippel-Lindau disease. Q J Med. 1990 Nov. 77(283):1151-63. [Medline]. Hes FJ, Feldberg MA. Von Hippel-Lindau disease: strategies in early detection (renal-, adrenal-, pancreatic masses). Eur Radiol. 1999. 9(4):598-610. [Medline]. 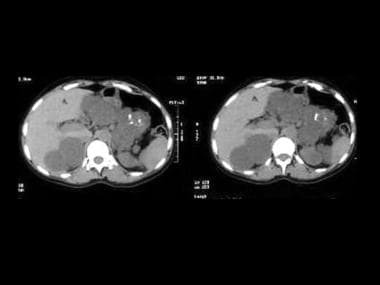 Sahi K, Jackson S, Wiebe E, Armstrong G, Winters S, Moore R. The Value of "Liver Windows" Settings in the Detection of Small Renal Cell Carcinomas on Unenhanced Computed Tomography. Can Assoc Radiol J. 2013 May 22. [Medline]. 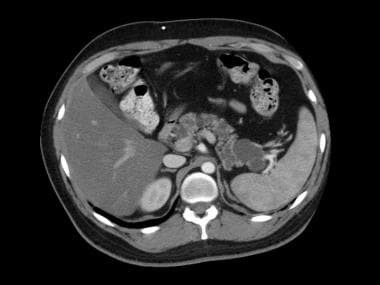 Kulkarni M, Purandare N, Zade A, Agrawal A, Shah S, Rangarajan V. FDG PET/CT Detects Clinically Occult Pancreatic Cancer in a Case of Von Hippel-Lindau Syndrome. Clin Nucl Med. 2013 Jul. 38(7):e302-3. [Medline]. 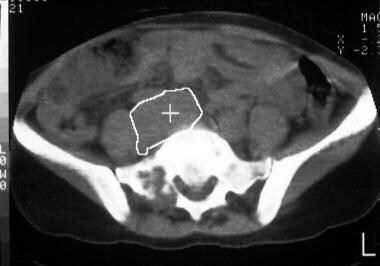 Graziani R, Mautone S, Vigo M, Manfredi R, Opocher G, Falconi M. Spectrum of magnetic resonance imaging findings in pancreatic and other abdominal manifestations of Von Hippel-Lindau disease in a series of 23 patients: a pictorial review. JOP. 2014 Jan 10. 15 (1):1-18. [Medline]. 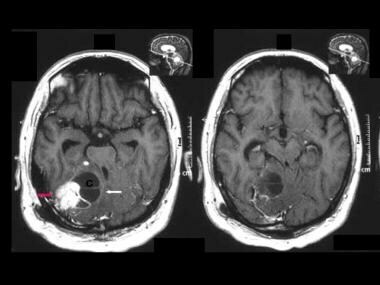 Mukherjee A, Karunanithi S, Bal C, Kumar R. 68Ga DOTANOC PET/CT aiding in the diagnosis of von Hippel-Lindau syndrome by detecting cerebellar hemangioblastoma and adrenal pheochromocytoma. Clin Nucl Med. 2014 Oct. 39 (10):920-1. [Medline]. Sharma P, Dhull VS, Bal C, Malhotra A, Kumar R. Von Hippel-Lindau syndrome: demonstration of entire disease spectrum with (68)Ga-DOTANOC PET-CT. Korean J Radiol. 2014 Jan-Feb. 15 (1):169-72. [Medline]. Grubb RL 3rd, Choyke PL, Pinto PA, Linehan WM, Walther MM. Management of von Hippel-Lindau-associated kidney cancer. Nat Clin Pract Urol. 2005 May. 2(5):248-55. [Medline]. Hes FJ, van der Luijt RB, Lips CJ. Clinical management of Von Hippel-Lindau (VHL) disease. Neth J Med. 2001 Nov. 59(5):225-34. [Medline]. Jagannathan J, Lonser RR, Smith R, Devroom HL, Oldfield EH. 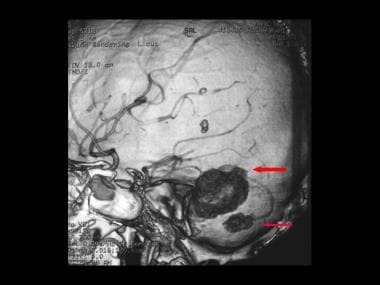 Surgical management of cerebellar hemangioblastomas in patients with von Hippel-Lindau disease. J Neurosurg. 2008 Feb. 108(2):210-22. [Medline]. Stendel R, Suess O, Prosenc N, et al. 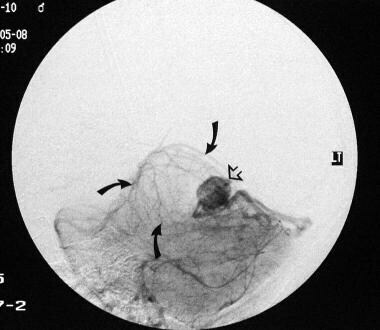 Neoplasm of endolymphatic sac origin: clinical, radiological and pathological features. Acta Neurochir (Wien). 1998. 140(10):1083-7. [Medline]. Leung RS, Biswas SV, Duncan M, Rankin S. Imaging features of von Hippel-Lindau disease. Radiographics. 2008 Jan-Feb. 28(1):65-79; quiz 323. [Medline]. Hough DM, Stephens DH, Johnson CD, Binkovitz LA. 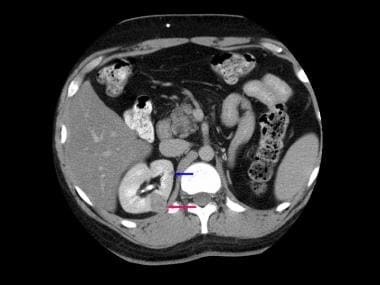 Pancreatic lesions in von Hippel-Lindau disease: prevalence, clinical significance, and CT findings. AJR Am J Roentgenol. 1994 May. 162(5):1091-4. [Medline]. von Hippel-Lindau syndrome. Sagittal vertebral angiogram shows a hypervascular lesion with intense and prolonged enhancement. von Hippel-Lindau syndrome. 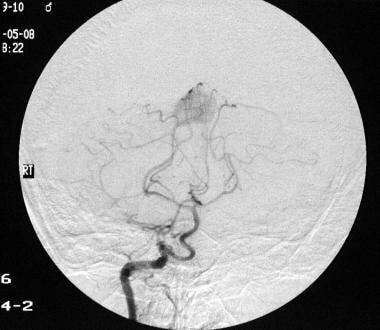 Coronal vertebral angiogram shows a hypervascular lesion with intense and prolonged enhancement. The final diagnosis was von Hippel-Lindau syndrome–associated cerebellar hemangioblastoma (same patient as in the previous image). 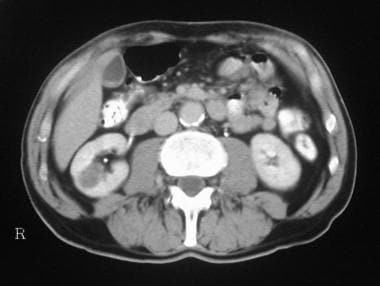 Axial upper abdominal CT scans unenhanced (same patient as in the previous image) and enhanced show multiple small cysts within the pancreas and larger renal cysts. There are 2 enhancing lesions suggestive of microcystic adenomas. 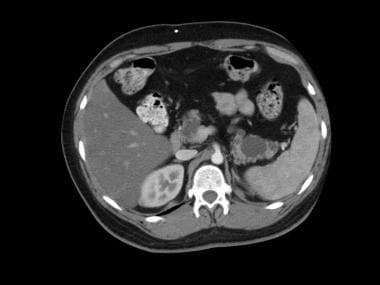 Fast Five Quiz: Can You Correctly Identify the Various Aspects of Renal Cell Carcinoma?